Construction well underway on Trago Mills’ new dedicated building materials outlet, set to open in May. 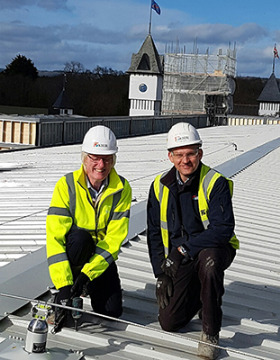 Following news last September that discount retailer Trago Mills would develop a major new £3m ‘Build Centre’ at its Newton Abbot site, the project is now well underway and Tragos’ chairman and owner, Bruce Robertson visited the construction site to put the final bolts into the roof. The building will incorporate many of Trago’s signature architectural features, including the three ‘Trago Towers’ – the first of which is currently under construction. Twelve new jobs will be created in the new development, as well as the 600 staff already employed in the Trago Mills Newton Abbot store. 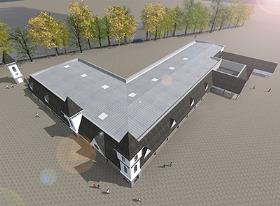 When completed, The Build Centre will boast a 2,088sq m purpose-built store stocking building materials, tools and workwear, plus an external stock yard of 1,209sq m offering a comprehensive range of heavy-sided goods. Credit account facilities will be available to trade customers. Chairman and owner Bruce Robertson said: “Construction is coming along well and we’re looking forward to opening later this spring. We’re pleased to now have a heavier, more build-centric offer available to the trade and construction sectors, not least as Teignbridge recognises and embraces the need for more homes for those in the community. The Build Centre will remain an accessible and welcoming environment for our existing avid DIYers, with a new level of expert professional advice readily available to all customers”. Construction and property development group, Kier is delivering the project, which is due to open at the end of May this year.